PedalPalFX is a boutique pedal manufacturer based out of Venezuela that we've featured on Reverb before. Their penchant for Marshall drive tones has resulted in the company's PAL 800, PAL 800 Gold, and PAL 959 pedals—effects units that capture the classic gain tones of Marshall's JCM 800 and Plexi amp heads. Today, Andy Martin is taking a look at their latest offering, the PAL 034 Night Overdrive—based off of Guns N' Roses guitarist Slash's enviable tone from his #34-modded Marshall SLP 100. The pedal is named after that particular modification as well as the band's song "Night Train." As you can see in the video above, the PAL 034 swaps the Marshall's tubes for transistors, shrinking the circuit down from an amp head to a stompbox capable of searing, '80s lead tones—whether you're rocking a Les Paul or a single-coil-equipped guitar. To hear all that the Night Overdrive can do, be sure to check out the full demo. 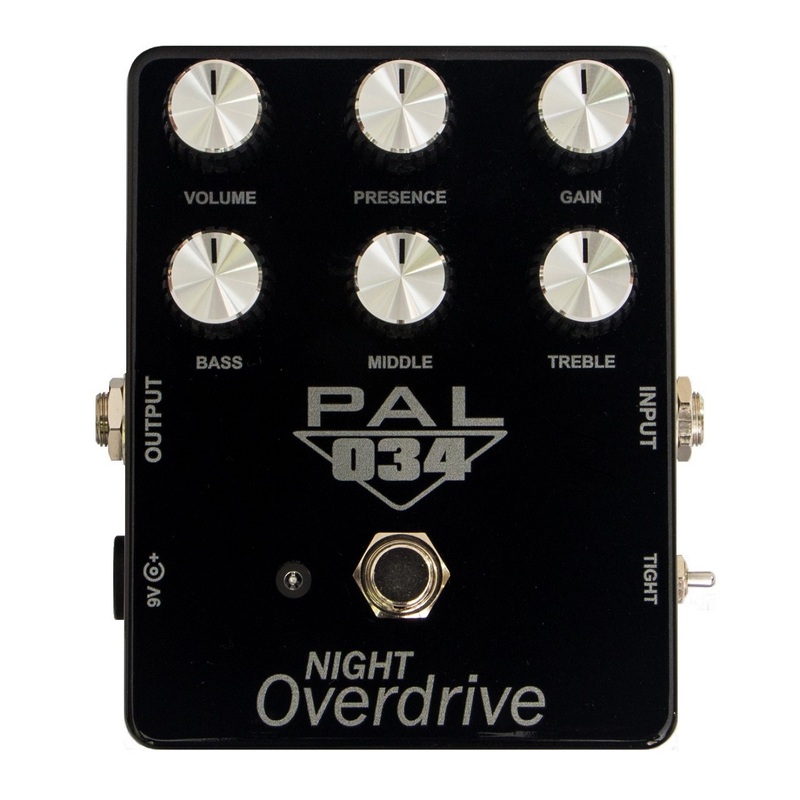 And click here to get your own PAL 034 straight from PedalPalFX. On a recent visit to Chicago, we also had the opportunity to talk to PedalPalFX's founders Luis and Alvaro about their business, their fascination with Marshall gain, and the creation of this newest pedal. Keep reading to see our interview below. PedalPAL's origin story is pretty unique. How and why did PedalPal Start? About 10 years ago, during a guitar lesson, the instructor told us that he was having a pedal clone made by someone locally. We were shocked by that. A clone? How is that possible? We asked him about it and he told us that there's a lot of information about that online. That night we were amazed at what we found about DIY pedals, so we started to make a Tube Screamer clone. In less than three days we had a working one and we were fascinated by it. Til this day the pedal is in working condition. You could say that that was the start of PedalPalFx. Calling Venezuela your home, where the socio-economic situation is not ideal right now, what are some of the difficulties you must overcome to keep PedalPAL thriving? They were challenges more so than difficulties. The most important one was guaranteeing inventory and the quality of the components we use to build the pedals. In order to keep standards high we decided to acquire 90 percent of our components from the United States. Depending on demand we usually try to produce the pedals three months in advance—this way we maintain our inventory levels for our Reverb shop. We also make sure we have the necessary components ready when we have a pre-order live in order to guarantee a timely delivery to our clients. What did both of you do prior to forming PedalPAL? Alvaro managed his own metal-mechanic business and I [Luis] worked on design for industrial and energy plants in the civil engineering sector. Quite the change, right? Are you able to operate full-time? We've been working on PedalPalFx full-time for three years now. We stopped making the pedals in our garage and we now have an office with a workshop for pedal-building purposes, a designated area to work on design, a studio to test the sound, a lab—and we're still expanding. It's incredible to see how this passion and hobby has become a way of life for us and we can proudly say that we now live off of rock 'n' roll. None of this would have been possible without Reverb and without feedback from our customers all over the world. We are truly very grateful for them embracing and trusting us as a brand. Why choose Slash as the player to curate inspiration for the new Night Overdrive and what inspired the name? Slash has been very consistent with his sound throughout his career and his tone is very particular—there's even something mystical about it when you try to recreate the legendary sound he produced in Appetite for Destruction. One of the important pillars of that sound is Mod #34, a particular modification on Marshall SLP 100s and JCM 800s, which is what we tried to recreate in this pedal. That's why the acronym is PAL034 and its name is based off of the famous song, "Night Train." Guns N' Roses - "Night Train"
What was the biggest challenge in perfecting his signature sound? Trying to recreate Mod #34 in a pedal was not easy at all. A lot of information exists about the mod with some variations, even Marshall did a great job with the AFD100 and the SL-5 that same decade. It took more than three years of research, experience, and development to properly create what we deem to be the Mod #34 sound within a pedal. We hope to meet our customer's expectations as well. What is next for PedalPAL moving into 2019 and beyond? The word "evolution" is a constant in everything we do. We study our process and look to improve every phase of it. We are very passionate about the Marshall sound, which is very evident, and the PAL034 Night Overdrive is another result of that passion and a contribution towards it. We're also working on a line called the Tribute Series, in which we plan to modify the circuitry on some of the legendary pedals that have been of great influence to us. There's a lot of work to do and we have every bit of passion necessary for it. Let's rock the world.